My co worker owns one and has had no issues, but i wouldnt buy one with an automatic as the new dual clutch is problematic.. manual transmission ones though are pretty solid reliable cars..
We have a 2013. It has been largely trouble-free, aside from a problem with the power locks. 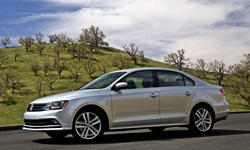 It has the 6-speed non-DSG automatic and the 2.5L 5-speed. I do not believe that this engine was available for 2015, but the transmission was still in use on the 1.4L and 1.8L turbocharged gasoline engines. The DSG is a higher-maintenance item included with TDI and GLS (2.0T) engines only. We bought a used 2015 model with 34,000 miles and have subsequently put on almost another 30,000 miles. Ours is an automatic (non DSG) 1.8 turbo. The car has been 100% reliable, although we've followed the factory maintenance recommendations to the letter. The only modification we've made was to get a sturdy aluminum skidplate to protect the plastic oil pan, because when we had the automatic transmission fluid replaced the transmission fluid pan had been damaged by road debris. That was about a $200 investment that's allowed us to drive over gravel, ice, and other road clutter without worry. Great practical car with just enough creature comforts like heated seats and voice-activated Bluetooth to make it a great daily driver and the turbo gives it enough "zip" to make it useful in traffic. Dual-clutch (DSG) or manual is the only way I'd go with a VW. The DSG is a mature feature and reasonable fears aboute it should've died out ten years ago. That does _not_ mean they're maintenance free. DSG services are at decent intervals. Expect a dual-mass flywheel swap at about 100k-170k. You'll simply know when it's time. The quality of these parts appears to be improving greatly over the last few years. The 5-speed manual is, well, simply excellent. I love my base-model '17 Jettas notchy gearbox. Great weighted feel, and properly geared for the American market. I can say the same about my 2007 GTI (with DSG)...great transmission and incredibly quick and smooth shifts.